…For the venitian farmers, once the harvesting season was over, there came the right moment for slaughtering the pig, marking the beginning of a period which lasted until the end of january. In those days each peasant family owned one animal, and for many of them this was their only source of wealth. On the appointed day, men, women and children alike would help the butcher known as the “mazzin” in the preparation of the various parts of the pig. At that time the peasant’s world was a poor one, a time when best cuts were offered for sale at the market in order to earn that sum which could in some way improve their miserable conditions. 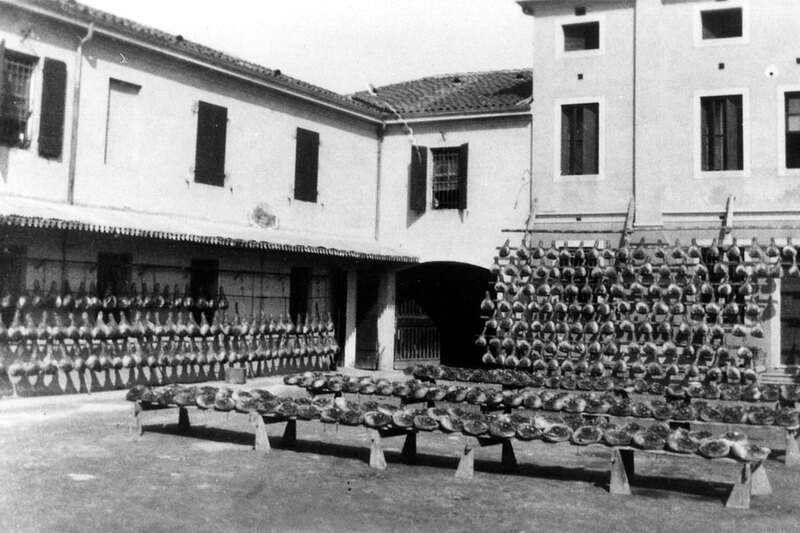 On the 25th of november, St Catherine’s Day, the agricultural shows in Montagnana and the other villages along the Berican-Euganean hilltops, marked the beginning of the bargaining for the best fresh hams. 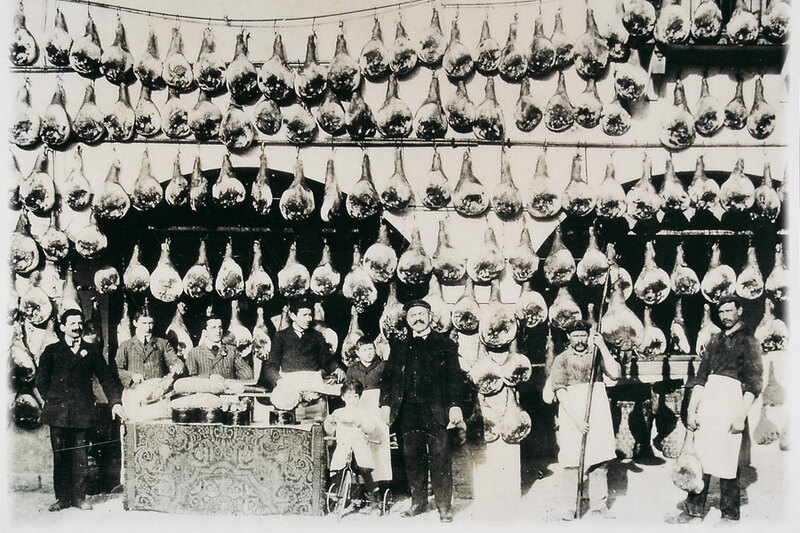 These were to become “prosciutti” in the hands of the specialist pork-butchers, the ancestors of today’s producers of hams. Expert hands would then kneed and sprinkle them with salt, carefully following the rules laid down by the Veneto school, rules which are even today strictly applied. Moreover the work of the master-pork butchers was aided and enhanced by the natural cycle of the seasons which added the necessary climatic changes. Therefore salting, drying and maturing processes came about in a natural atmospheric environment, taking the greatest advantage of first the dry and cold conditions and then little by little the increasing midness of the climate. Finally, when the season was right, the “prosciutti” were washed down in the open air and then hung out to dry. They were then distributed amongst the best pork-butchers in the city. 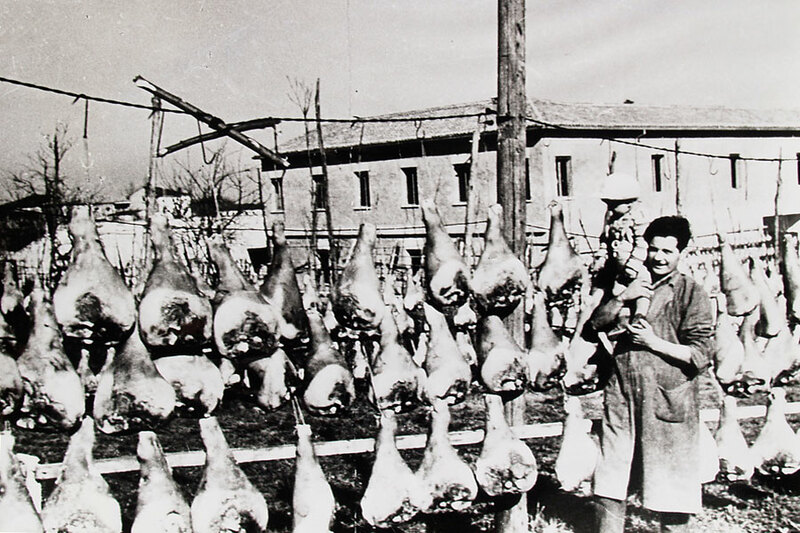 Foto d’epoca che mostrano il lavoro dei produttori.